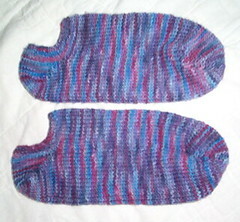 Nicole's Needlework: Finished Ankle Socks! They're really not that bright... it's the flash. Oh well! :) I'm still so sick. My throat still hurts so bad. I just wish the pain would go away!! Hopefully tomorrow it will be better. Well, not much else. Write more later!